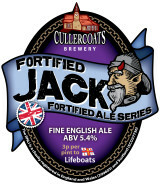 The Fortified Series harks back to an old way of producing beer, which was popular in the 18th Century. 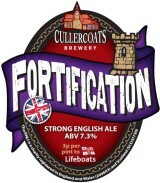 A very strong beer (a stock ale, typically 6-8%) was brewed first and allowed to mature for several months and then used to blend with weaker, newly brewed beer. 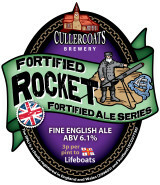 This creates a mid strength beer which benefits from the old ale flavours which can only be achieved in a high gravity, warm fermentation, AND the fresh hoppy aromas delivered by the newly brewed, weaker beer. 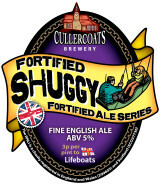 We have brewed a ‘stock ale’ ABV 7.3% which we have named Fortification, and over the coming months we will be blending this with different beers to produce a fortified version, for example Fortified Shuggy Boat Blonde, a new beast, bursting with flavour! If you’re lucky you’ll be able to taste the fortified beer alongside the regular beer AND Fortification itself – mummy, daddy, and baby beer, as it were! Look out for this line up at a special Fortified Beer and food evening on 21st April at Bierrex, Pilgrim Street, Newcastle. This blend produced a really delicious 5% dark amber coloured ale, plummy notes with the balancing dry citrus from Nelly, stronger than it tastes, so go steady! 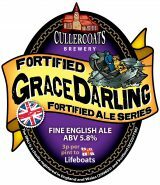 The third of the blended beers series coming in at 5.8%, it’s amber in colour, with the full citrussy hop flavours of Grace Darling Gold but with a much bigger malt profile as well. Tell us what you think!